The dress shape set to become a new classic and the hit shoe to be seen in, let the Joules Capsule Collection guide you through the next few months and beyond. When it comes to our wardrobe choices, there’s something about summer that triggers that adventurous side in all of us. Whether it’s a loud colour, busy print or bold new shape, the warmer months sees more of us adopting something out of the ordinary and braving new styles we’d otherwise ignore. Here at Joules we call it the ‘sunshine effect’ and while we’re all for experimenting it’s essential that you don’t accidentally overlook those fundamental summer buys either. You know the ones, they hang there on the rail being all easy and reliable, always capable of fixing a nothing-to-wear day – yes, those. These principle pieces may not be the all singing, all dancing stars of the show, but trust us, they make complete new season wardrobe sense. The type of buy you’ll reach for time and time again, these are the key players that’ll inject even the most neglected closets with a new lease of life. Working extra hard and acting like glue gelling everything else together, investing in these essentials means you’ve got all bases covered throughout the next few sunshiny months. While we know you’ll always indulge in those fun, eclectic summer pieces (and so you should) these gems will inject some reliable oomph into your warm weather styling. Think of them as the secret weapons of your summer wardrobe, and love them all the way through to autumn. Warning: you’re going to be hard-pressed to resist. 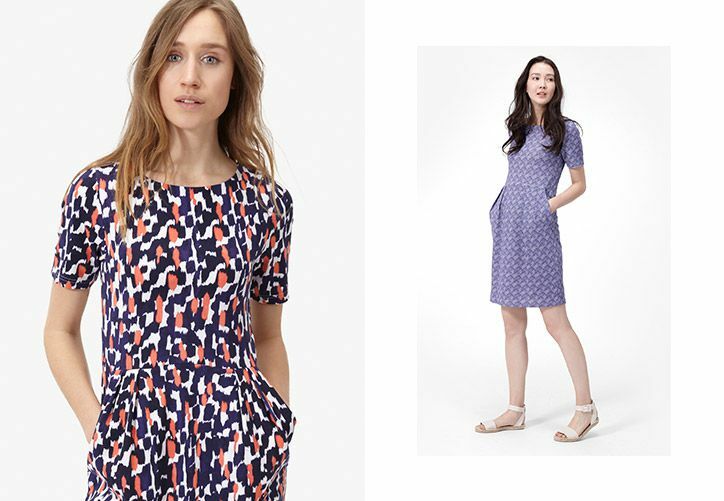 Nothing spells easy quite like a dependable summer frock. Step forward, Ariana. A cool, comfy jersey finish is elevated with elegant pleated details (middle-skimming no less) and utility-inspired pockets. Choosing between the arty abstract and geo prints is a tough choice but while you ponder, we’ll just add that she’ll work at the end of the year too, with the right boots and jacket. If your idea of spring/summer is more minimalist than maximalist, then it’s time to make friends with a pair of ultra preppy city shorts. Add vests, tees, and blouses on top, plus a statement accessory like a straw sun hat or tassel necklace and you’re done. Designers have taken to sending their models down the international runways in practical – and always pretty – statement making trainers. So you see you’ll be in good company carpooling the children this summer. Our neat retro silver petal and blue ditsy floral print styles are on trend, cute and comfy in equal measures. Nothing is going to catapult Riviera chic into your style quite like a beautiful kaftan. Don’t be fooled into thinking this is strictly beach territory though because this floaty summer essential is multi-talented. With its appealing poncho shape and elegant sheer finish, the obvious outfit is over your bikini or costume poolside. The rest of the time try it with a light cotton top and white jeans. Accessorise with layered long necklaces and bangles. Our Hailey skirt has got that offbeat elegant thing the French do so well, all wrapped up. It’s that great flippy shape, with a slightly sporty high waistline and manageable hem length – the winning trio. Pick your pattern and let her do all the hard work – a simple white tee, classic sleeveless top or Chambray shirt will suffice here. Pop a blazer on top for warmth and guess what – next season she’ll work even harder with your collection of woolly tights and boots. 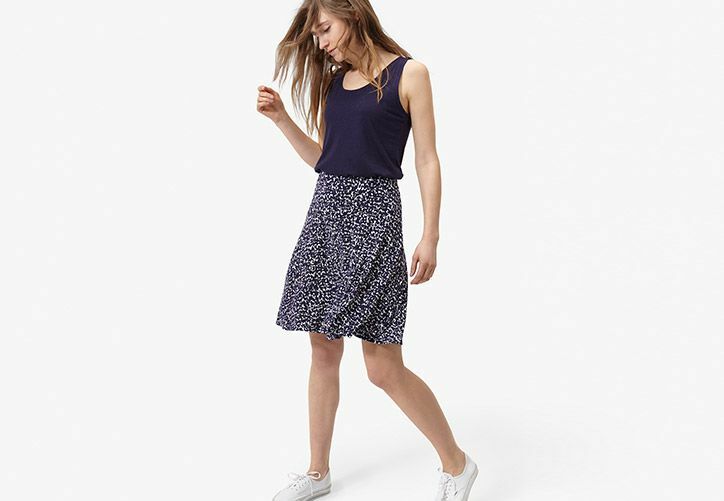 A skirt with staying power! What’s your favourite summer staple? Comment below.